Indian Railways envisaged to construct toilets in circulating areas of all stations. These toilets will contain low cost sanitary pad vending machine and incinerator in female toilets; and condom vending machine in male toilets. The approximate Cost of one station will be Rs. 22-30 lakh. Railways Minister Piyush Goyal on September 11, 2018 launched the 'Rail Sahyog' web portal to provide a platform for the Corporates and Public Sector Units (PSUs) to contribute to creation of amenities at or near Railway Stations through Corporate Social Responsibility funds. The app launch was in line with PM Narendra Modi's vision for a New India by 2022. It was a part of various initiatives undertaken recently by Indian Railways for upgrading its infrastructure, technology, hygiene among host of other things for an enhanced passenger experience. • The web portal www.railsahyog.in will enable desirous companies to show their willingness on the portal by registering their requests. • The requests will be processed by Railway officials. • Based on the principle of first come first serve, the requests will be shortlisted and selected applicants will be intimated to deposit the funds with Railways or with nominated agencies like RITES/RAILTEL etc. • The nominated agency will get the work executed thereafter. • This simple & transparent portal will provide an opportunity for industry, companies and associations to collaborate with Railways. • This portal will not only be beneficial for passengers but also for neighbourhood of Railway vicinity. • The portal has been envisaged as a platform for all, including individuals as also private & public organisation, to contribute towards Corporate Social Responsibility (CSR) activities in association with Indian Railways. • It will remove all hurdles faced by the companies for cooperation with Railways. 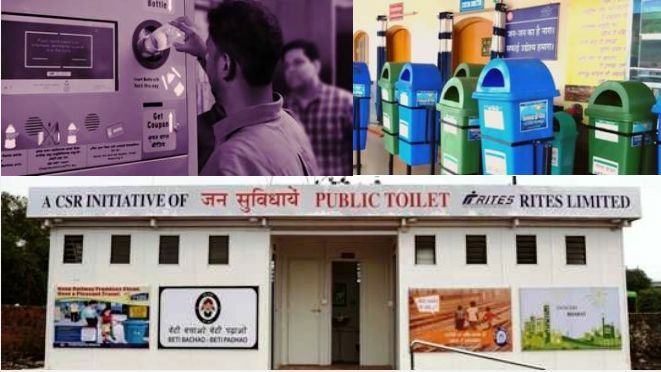 • Indian Railways envisaged to construct toilets in circulating areas of all stations. These toilets will contain low cost sanitary pad vending machine and incinerator in female toilets; and condom vending machine in male toilets. The approximate Cost of one station will be Rs. 22-30 lakh. • Providing free Wi-Fi at stations through setting up Hotspots and the approximate cost one station is Rs 10.30 lakhs to Rs 12.30 lakhs. • Provision of benches at station platforms as facility for senior citizens and disabled with Rs 17500-47500 as approximate cost for per set. • Bottle crushing machines at 2175 major stations for ensuring environmental sustainability and managing plastic pollution. The approximate cost one machine is Rs. 3.5 lakhs to Rs. 4.5 Lakhs. • Dustbins will be provided at all stations under the Swachh Bharat Mission to prevent littering around. The approximate cost for two dustbins is Rs. 4500.